Alerta Migratoria – a local, Durham-based resource for undocumented immigrants seeking asylum in the US. Capital Restorative Justice Project – promotes healing and nonviolent responses within NC communities torn apart by murder and executions. Criminal Justice Resource Center – provides a variety of services for persons along the criminal justice system continuum. 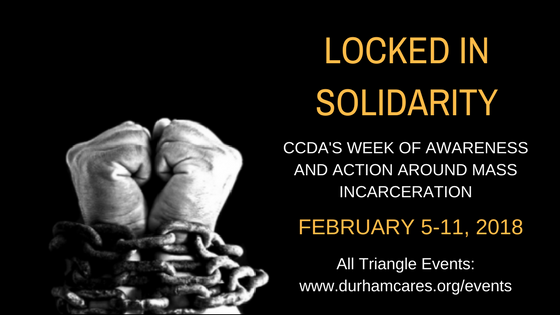 FADE – a growing group of Durham residents concerned about the interrelated issues of racial profiling, selective enforcement, excessive force, and police harassment in our city. Forward Justice: a nonpartisan law, policy, and strategy center dedicated to advancing racial, social and economic justice in the U.S. South. Forward Justice’s Formerly Incarcerated, Convicted Peoples and Families Movement was established to elevate the input and expertise of those most affected by the criminal injustice system. Inside-Outside Alliance – supports prisoners’ struggles on the inside and participates in struggles on the outside against our system of injustice that includes police, prisons, courts and immigration laws — the revolving door of incarceration. Jubilee Home: creates a supportive and therapeutic living environment for justice involved young men that enables them to transition back into their community in a fruitful and meaningful way. Religious Coalition for Nonviolent Durham – a nonprofit organization comprised of individuals who as an expression of their faith and goodwill actively seek an end to the violence that is plaguing Durham neighborhoods. Church Beyond the Walls – brings congregations in central North Carolina who hunger for community together with currently and formerly incarcerated women and men who’ve tasted beloved community and carry with them some wisdom about how to build it. Project Turn – (Transform, Unlock, ReNew) creates a learning environment in which incarcerated men and women and students from outside prisons can learn alongside one another as classmates. Second Chance Equipping Center – strengthens individuals with skills necessary to restore self-worth in order to rebuild broken lifestyles and re-enter society self-sufficiently. Harm Free Zone – The Harm Free Zone emphasizes independent and self directing community autonomy as a necessary step towards creating shared collective accountability strategies and practice. All of Us or None – All of us or none is a national organization initiative, with a chapter in Durham, started by people who have been in prison and/or been impacted by the criminal justice system to fight against the discrimination that currently-and formally-incarcerated people and our families face every day. Southern Coalition for Social Justice – The Southern Coalition for Social Justice partners with communities of color and economically disadvantaged communities in the south to defend and advance their political, social and economic rights through the combination of legal advocacy, research, organizing and communications. Through its Criminal Justice initiative, the Southern Coalition for Social Justice (SCSJ) tackles racial discrimination at the legal and policy levels to eliminate obstacles facing those with criminal records as they attempt to re-enter the mainstream of society. Southerners on New Ground (SONG) – a Queer Liberation organization made up of people of color, immigrants, undocumented people, people with disabilities, working class and rural and small town, LGBTQ people in the South. SONG is sponsoring Free From Fear, a forum focusing on bail reform as a means of making Durham’s criminal justice system more equitable. StepUp Durham – adults and children transforming their lives through employment and life skills training. Straight Talk Support Group – Provides 360-degree support for the family and friends of those currently or formerly incarcerated. Know of other resources? Email us at [email protected].